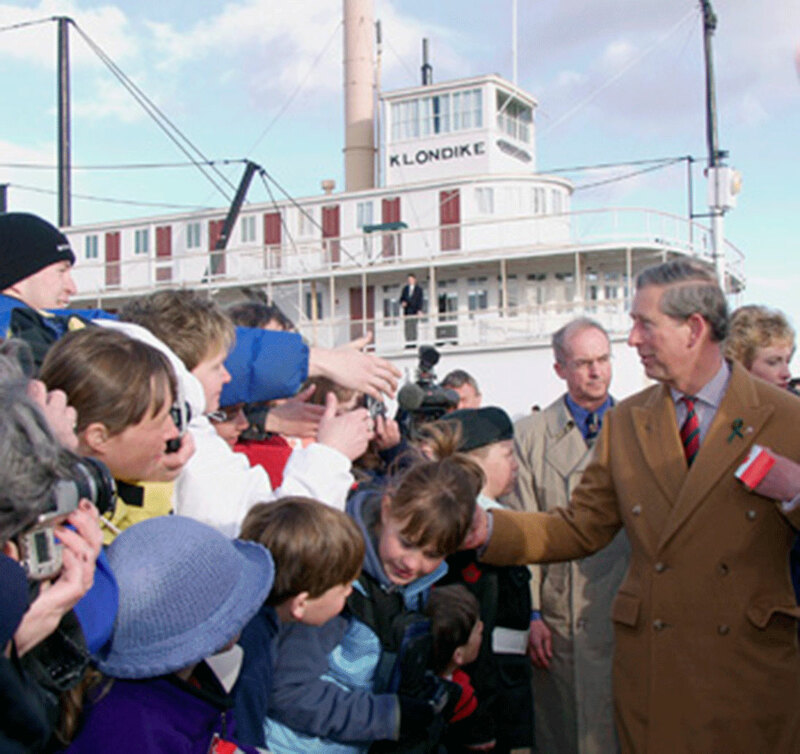 Prince Charles 15 minutes after his arrival in Whitehorse, greets Yukoner's at the S.S. Klondike. The Yukon’s beauty compelled the artist in Prince Charles put paint brush to canvas during his trip. “When I arrived yesterday, I was so enormously inspired by the quality of the light as we flew into the airport and being a very amateur water-colourist, I must say I was so inspired last night before I went to bed, I had to sit down and try and do a tiny watercolour of the impression that I had from the light on the snow-covered mountains as we came in,” the Prince of Wales said Sunday evening at a dinner in his honour at the Westmark Whitehorse Hotel. “And of course, I wish I could stay a bit longer because the painting possibilities ... are enormous.” The prince spoke just before the dinner, which was hosted by the territorial government. The event was attended by local politicians, dignitaries and 16 Yukoners who won a contest and their guests. The heir to the British throne was not disappointed by what awaited him here in the Yukon. “I arrived here to find the most wonderful warm and friendly welcome you could possibly imagine. I couldn’t believe that so many people had appeared by the (S.S.) Klondike, next to the river, at what I can only imagine was an unsociable hour,” he said of the Saturday evening greeting. “I was hugely touched by the sheer warmth of that welcome, which I shall never forget. And as a result, I can now recognize most of the people in Whitehorse. I seemingly met most of them last night. Some of them, at least three times,” he joked. He also talked more about the beauty of the territory and hoped it will remain the way it is. “I have discovered for myself that the Yukon is a region of matchless beauty. Its unspoiled, almost pristine, nature is something immensely perfect, in an age where we have done such unmentionable things to our planet,” he said. “And I can only pray, that during this new century that we have recently embarked upon, we will have the sense to learn from the ancient wisdom of the first nations people that above all understood the sacred nature of the land.” In his speech, Prince Charles also referred to the size of the territory. While he didn’t walk for days in the territory, the prince did get a chance for a couple of strolls while in Whitehorse over the weekend. After arriving in Whitehorse on Saturday evening, the prince attended the official greeting at the site of S.S. Klondike paddlewheeler on the shores of the Yukon River. At the welcoming, at which more than 2,000 were there to greet him, the prince was able to wander around the site, inspecting a Canadian Rangers honour guard and speaking to many people who waited behind barricades. The prince arrived just after 7 p.m. on a windy night at the S.S. Klondike site. But some people waited for over 1 1/2 hours to be at the front to meet the prince. Cindy Chiasson and Jane McIntyre were standing at the barricades awaiting the prince’s appearance. McIntyre said she came out to see the prince because she’s from the same land as the royal. “I’m from England, so of course I’m going to come,” she said. McIntyre added that her parents bought their house from the prince’s late wife Diana’s father, the Earl of Spencer. Chiasson’s daughter, Samantha, 14, was a member of the army cadets honour guard which was standing at the barricades. She said her daughter was excited about the event. Before going to the crowd, the prince also received a gift from first nation chiefs — Grand Chief Ed Schultz, Ta’an Kwach’an chair John Burdek and Kwanlin Dun Chief Rick O’Brien. As well, the prince spoke to some seniors and elders who were seated inside the barricades. Olive Storey, was one of those seniors who met the prince. She met his father, Prince Philip, on one of his tours of the North. “I told him that I knew his dad because I met his dad up at Coppermine (N.W.T.) in 1953,” she said. Storey had on a multi-coloured floppy hat which the prince remarked about. “He said he liked my hat,” she said. On the cool evening, a few people said warmth was a topic of conversation for the prince. Judi Johnny, who was covered by a blanket, spoke to the prince. “He asked me if I was warm enough,” she said. “He said, ‘You must be used to this by now.’ And then he said, ‘It’s a shock for me.’ And he shook my hand.” After the walkabout through the crowd, the prince was part of a group photo of the organizers of the visit to the Yukon. One of the people in the photo, Liberal cabinet worker Bernie Adilman, said the prince was cracking jokes as the group posed for the photo. “He’s got a very good sense of humour,” said Adilman. The greeting was the only official event on Saturday night. On Sunday morning, the Prince of Wales emerged from the Westmark, where he was staying, and made the short walk over to city hall where he was greeted at the Steele Street entrance by Mayor Ernie Bourassa, his wife, Linda, and three-year-old granddaughter, Callista Isaac, who presented the prince with a book on the Northern Lights. Inside the council chambers, the prince met with youth and seniors, as well as the city’s volunteers of the year, Henning Hansen and Ralph Simpson. At the ceremony, Bourassa presented the prince with a hand-carved walking stick made by Yukon artist William Besner. The stick came with a sheath made of moose hide that was made by Besner’s sister, Marianne Gatensby. The prince said he would treasure the hiking staff. “What encourages me so much is to know these traditional crafts are still flourishing,” he said. Following the city hall event, the prince went for Sunday morning church service at the Old Log Church on Elliott Street. Instead of driving, the prince decided to walk to from city hall, along Second Avenue and then up Elliott Street to the church. On that walk, some people got close enough to take pictures of the royal. Shelley Lewis had thought of seeing the prince Sunday but then forgot until she was driving along the street and saw the entourage of press outside. She parked her car and walked near him, where she took photos of him. “I’m surprised he walked,” she said. Lewis then went to the Old Log Church, where she spoke with him. She said she heard on the news the prince sometimes keeps his hands in his pockets to prevent him from shaking people’s hands. When she spoke with him at the Old Log Church, he had both hands in his pockets. Lewis was getting pictures of the prince for her mother, who attended his mother’s coronation in England in 1952. Once he reached the church, there was another group of people he greeted before the church’s Rev. Mary Battaja and Anglican Bishop Terrence Buckle welcomed the prince into the church. Grace Snider of Whitehorse was waiting outside the church and shook the prince’s hand. “I said, ‘I really wanted to shake your hand,’” Snider said after the prince entered the church. “And he said, ‘I hope it won’t do you any harm.’ And I said, ‘I wore a glove.’” The prince laughed at her joke. Another person waiting outside the church was Veronica Mallerby of Whitehorse, who had also chatted with him briefly on Saturday night at the S.S. Klondike. Mallerby was part of the Carcross scouts and guides in 1959 and met the prince’s parents as a Girl Guide during their trip that year. She said getting the chance to see the prince was something she wanted to do. “I was born in Britain; it was really important to me,” Mallerby said of the visit. After the church service, the prince spoke to a few more people, then hopped into a waiting GMC Yukon that took him to the airport, from where he flew to Mayo. He returned in time for last night’s dinner in the capital. The prince flew out of Whitehorse this morning, headed for Toronto and the end of his official visit.